“The time of women is coming.” Uttered by a character early on in Corrib Theatre’s production of Belfast Girls, it sounds like foreshadowing. This is a play, after all, about five women escaping Ireland during the Irish Famine of 1845-1852. They board a ship called the Inchinnan en route to Australia, with hopes of a better life. What we know, of course, and what the playwright Jaki McCarrick knew when she wrote this play in 2015, was that the time of women is still coming. The statement – and these five fiery female characters – are particularly prescient today, amid a sea change in women’s rights, particularly the right to be free of sexual abuse, assault, and harassment. But we all also know that time can’t come soon enough. When Belfast Girls begins, we meet four women escaping Ireland, bonded by a shared dorm quarters on the ship taking them toward their dreams. There is the de facto leader, Judith (Anya Pearson), a well-spoken woman unafraid to speak her mind. She is joined by Ellen (Brenan Dwyer) – “stupid Ellen,” as Judith calls her in the beginning, but we learn there is much more to her than anyone realizes. Hannah (Summer Olsson) – called “fat Hannah” by Judith and her other companions – carries more grief and resilience than anyone should have to muster. Sarah (Hannah Edelson) is the stranger in the group, a country girl – and the only one who was not a street girl in Belfast. Still, she has her reasons to be here, and we’ll learn those soon enough. These four are joined before departure by Molly (Tiffany Groben), a weak and sickly maid from outside of Belfast who has carried on books and more than her share of secrets. Corrib Artistic Director Gemma Whelan’s direction is deft, complemented by Lara Klingeman’s fabulous set: three bunkbeds in a row, where the characters will make their beds for the months at sea, and where many of the most compelling and important scenes play out. When all the girls are in their bunks, and the lights dim and blue, each character is in her own rectangular frame (Anthony Arnista’s lighting work is marvelous throughout, setting the tone and moving things along between and during scenes), which is appropriate given that each comes to the ship with her own story and memories. These unravel, of course, to each other and the audience, over the course of the play. Because there are just five characters and nearly every scene takes place inside their dorm on the Inchinnan (or outside on its deck), it is important that every actor carries her weight and rises to the occasion – and Whelan has assembled a cast fully capable of doing that and more. Pearson brings a fierce strength to Judith that helps audiences believe these other strong women would look to her as an adviser. Dwyer is funny as Ellen, but also brings a depth and compassion that this character and others will need before the play is through. Edelson plays the outcast country girl with anger simmering from beneath the surface, important to set up her eventually lashing-out at her dorm mates. Groben brings a sweet innocence to Molly that you will root for and believe in, just as Judith does. And Olsson almost steals the show as Hannah, whose grief is never raw but always inside, just out of sight, where she more readily admits to lust or hides behind her quick wit. While the set, lighting (by Anthony Arnista), and music (sound design by Sharath Patel) all blend perfectly to drive the story and characters along as the ship sails across the ocean, the performance hall creates the only problem with the production. Shaking the Tree Theatre’s space is big and open, and the acoustics can be troublesome if the set and actors are not just right. The combination of Irish accents here with the echoing warehouse space led to the actors sometimes being hard to hear – Pearson and Edelson, in particular. 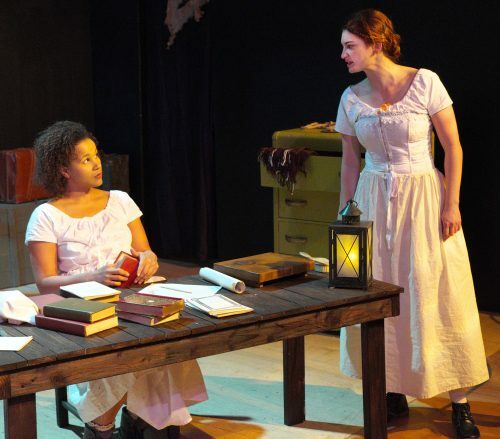 Thankfully, those hard-to-hear moments do not overshadow this fine production of a particularly resonant story about women trying to overcome their stations in life – and ultimately finding that the hope lies in the journey more than the destination, partly because there aren’t the same problems on a ship full of women that there are in the world filled with men. At one point, Molly muses to Judith that men run the world. “And look at the world,” Judith replies. That statement, and Belfast Girls, rings truer than ever in 2017, even though the Irish Famine took place what seems like a world and several lifetimes ago. 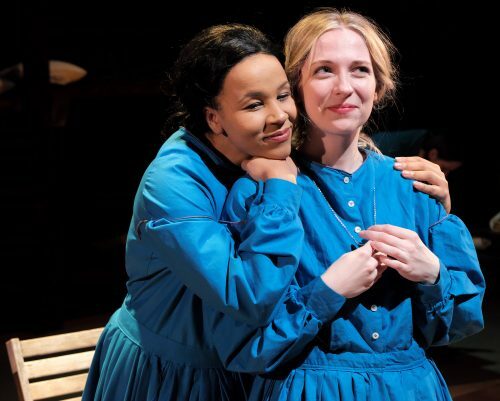 Corrib Theatre’s Belfast Girls continues through Dec. 10 at Shaking the tree. Ticket and schedule information here.